For years, roller coasters were more or less the same. Most of them featured wooden structures, typically arranged in a lattice and painted white. Their tracks were generally made of wooden stacks topped with a thin and narrow strip of metal along which trains outfitted with steel wheels would roll. In 1959, however, Disneyland Park, in conjunction with ride manufacturer Arrow Dynamics, introduced Matterhorn Bobsleds, the world's first tubular steel coaster. By using a steel structure, a tubular steel track, and trains with polyurethane wheels, the Matterhorn revolutionized the industry. As other steel coasters emerged, park visitors were able to experience two distinct types of coasters: Wooden and steel. In 2011, Six Flags Over Texas and Rocky Mountain Construction rolled out the New Texas Giant. Again, a park and ride manufacturer revolutionized the industry by creating a third category of thrill machine: the hybrid wooden and steel coaster. But what exactly is this new breed? The short answer is that rides such as the New Texas Giant marry a steel track to a wooden structure. There is more to it than that, however. First, a bit of history: Hybrid coasters, in one form or another, have actually been around for a long time. People are often surprised to discover that some older coasters, such as the circa-1927 Cyclone at Coney Island, have a traditional wooden coaster track but use a steel structure. The Cyclone's white lattice structure might look like it is wooden, but it is made out of steel. Regardless, it behaves like and is generally considered to be a wooden coaster. Conversely, there are coasters such as Gemini at Cedar Point that merge a tubular steel track with a wooden structure. Because of its steel track, Gemini is essentially a steel coaster. Technically, Gemini and the Coney Island Cyclone could be considered hybrids. (It might be fair to label a ride such as Revenge of the Mummy at Universal Studios, which features both roller coaster and dark ride elements, as a hybrid coaster as well.) 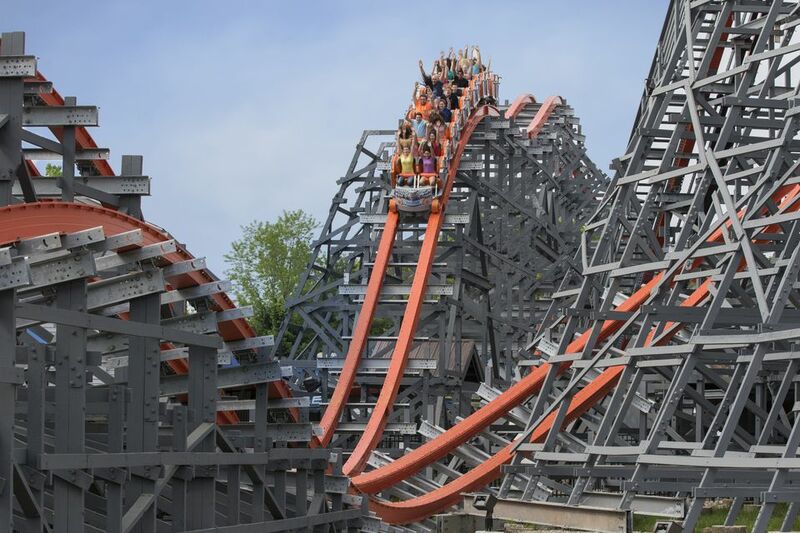 But, for the sake of this article, let's define a hybrid wooden-steel coaster as having a well-defined set of features that follow the New Texas Giant prototype at Six Flags Over Texas. Mostly, it's about the track. According to Fred Grubb, owner of Rocky Mountain Construction, the evolution of the hybrid coaster was due more to necessity being the mother of invention rather than a grand plan. Parks, including some in the Six Flags chain, had called his company in to try to repair and finesse aging, rough wooden coasters by partially re-tracking them. Like a municipal patching crew that fills potholes after a rough winter, the repairs would work temporarily, but the coasters would inevitably return to their excessively rough ways. Grubb and his team figured there had to be a better way. Their solution: Rip out the traditional wooden coaster track and replace it with a steel one. But not just any track. Instead of a tubular steel track, the Rocky Mountain folks developed a patented "IBox" steel track that they also refer to as "Iron Horse" track. As its name implies, the innovative track is shaped like the letter "I." The coaster trains' guide wheels, which are located on the sides of the wheel assemblies, fit snugly into the channels created by the tops and bottoms of the "I." Like a steel coaster, the trains on Rocky Mountain's hybrid rides use polyurethane wheels. The main wheels roll along on the flat surface of the IBox track. The combination of elements (especially the IBox track) yields deliriously smooth rides that are reminiscent of the best steel coasters, yet the hybrid coasters somehow retain their rough-and-tumble wooden coaster identity at the same time. The cars more closely resemble ones found on wooden coasters than steel ones. The IBox track also allows the hybrid rides to mimic steel coasters in another critical way: They include inversions. It is a giddy if disconcerting experience to ride a wooden-ish coaster and experience a barrel roll or other topsy-turvy element. What's more, the inversions, like the rest of the hybrid coaster rides, are freakishly smooth. By performing track replacement surgery on aging wooden coasters, Rocky Mountain has radically transformed them from wildly rough duds into wild studs. The company typically retains the basic layout of the original rides and reuses most of their wooden structures. Virtually all of the old rides have become critical and fan favorites. And parks and fans are clamoring for the company to do the voodoo that they do so well on any number of other old, rough woodies. By the way, Rocky Mountain has pioneered another wooden coaster innovation: The "Topper" track. Like a traditional wooden coaster, it uses a wooden structure and a track comprised of wooden stacks topped with steel. Instead of a thin band of steel, however, Topper track is thicker and wider with the steel covering the entire top of the wooden stack. Its trains use polyurethane wheels instead of steel wheels. Like the hybrid rides that use IBox track, the Topper track-equipped coasters are also capable of inversions. (And like the IBox rides, they are wonderful coasters.) Example of Topper track coasters includes Goliath at Six Flags Great America and Lightning Rod at Dollywood. For the sake of this article, let's consider the Rocky Mountain rides that use Topper track to be wooden coasters and not hybrids. Up to this point, all of the Topper track coasters have been new rides that Rocky Mountain has built from the ground up. And all of the hybrid IBox track coasters have been retrofits of existing wooden coasters—although there is no apparent reason why Rocky Mountain couldn't build a brand new hybrid coaster with an IBox track.